The influx shelter or “tent city” located at the port of entry in Tornillo, TX is used to temporarily house unaccompanied children. I recently had the opportunity to tour the Tornillo shelter with a group of advocates and stakeholders. From the very beginning I was impressed with the competence and transparency of the managing company, BCFS led by Kevin Dinnin, who has been vocal on the Trump administration’s recent family separation policy. Our tour through the campus was very thorough, and we were shown the operational headquarters, living quarters, medical facilities, and recreational areas. The children in this facility, ages 13 to 17, were transferred from one of the Office of Refugee Resettlement’s (ORR) state licensed facilities where they were medically screened and have generally been identified as having a parent, legal guardian or immediate relative qualified to sponsor them. Initially, Tornillo was brought online in June 2018 with a capacity of 400 beds. That contract was extended again in July, and then in September, ORR renewed its contract with BCFS emergency management company to extend the shelter through the end of 2018. In early August, the shelter housed approximately 130 kids. At the time of our visit, and within just a few weeks from that time, there were 1,661 children being held at Tornillo. Under the newest contract, the total bed capacity was expanded to 3,800. Part of the increased capacity includes 1,400 beds slotted for emergency hurricane shelters for unaccompanied children in the ORR influx facility in Florida. The recent expansion also includes the addition female children to the Tornillo shelters which previously only housed male children. A recent report by the New York Times details the circumstances in which kids are transferred to Tornillo, often in the middle of the night with no notice. The constant changing of norms for these young people will only compound anxious behaviors and fears. The children are housed in air-conditioned pop-up tents (“Western shelters”) that are built to withstand winds up to 75 mph. There are 10 bunkbeds and 20 children in each tent with a staff ratio of 7-to-1. Three staff members are with the group of 20 at all times including overnight. Unfortunately, the sleeping quarters are tight, and there is no room for free space within the tents. Additionally, staff are not allowed any physical contact with the kids, and the kids are not permitted to touch even the bunk of another child. According to officials, at least one staff member per group is required to speak Spanish, and they use technology to support translating indigenous languages. By far the greatest number of children were from Guatemala, while Honduras and El Salvador followed respectively. They have a daily schedule that includes time for sports, movies, and optional religious services on the weekends. Overall, recreational activities are encouraged, and a turf field was created for soccer. However, because these facilities are labeled as influx shelters, there is no requirement for BCFS to provide educational materials or classroom learning. We were informed that the children were provided with workbooks that they could choose to complete. Because of the location of the facility, the entire site was created to be 100 percent self-sufficient. Water is brought in daily, food is catered by a food services group out of San Antonio, power is supplied by generators, and there are emergency services on site including a fire truck and ambulance. Officials on the tour admitted to trial and error in the types of foods the kids like—as well as the need for cultural adaptations to the menu. The onsite medical clinic is available for children who experience a variety of minor medical problems. The nurses who run the clinic are mostly pediatric RNs with ER experience. The most common health issues served are influenza-like illnesses (ILIs) and injuries sustained during recreational time. Prior to their transfer to the shelter, children are medically screened. Medical personnel at the facility explained that they do not administer psychotropic medications at Tornillo, and any child who requires such medications is sent to another ORR care provider. The clinic keeps a list of allergies as well as special restrictions regarding physical activity. Unlike other non-influx ORR facilities, children in Tornillo do not have access to regular mental health services or counseling, as there is one mental health clinician to every 100 children. The mental health services provided for an influx facility consists of only of crisis intervention and behavioral response. This is concerning given the high number of kids in this population who have been exposed to trauma and sexual and physical abuse. This exposure can have significant negative consequences for the social, emotional, and physical well-being of children. It is vitally important that these needs are addressed so that the child may begin to heal and build the necessary skills to cope with the trauma he/she has experienced. Another point of concern was the grievance process available to the kids. There were private rooms with phones available to report abuse allegations—yet these rooms are located in the middle of the common areas, and the children must be accompanied to the phones by a staff member. Additionally, there is a box for concerns where kids may write anonymous complaints. However, these complaints are handled internally by a staff member rather than an outside source. New administrative procedures and enforcement measures targeting the sponsors for these children are causing the numbers to increase drastically even though the number of arrivals remains steady. Earlier this year ORR and Immigration and Customs Enforcement (ICE) entered into an agreement that requires close cooperation between the two agencies. Part of this agreement includes an exhaustive vetting process by ICE of those who come forward to sponsor these children. It has been documented that this information is used to target sponsors for deportation. Another piece of this process is a new requirement for all adults in the household of a potential sponsor to be fingerprinted. According to officials at Tornillo, more than 60 percent of the kids in their care are waiting on the lengthy fingerprinting process before being released to a sponsor. As the process slows down there is growing concern for youth who turn 18 during their time in ORR and are then transferred into the custody of the Department of Homeland Security (DHS). These procedures are causing widespread fear among sponsors and family members as well as a logistical nightmare to accommodate the drastic increase in the number of persons being fingerprinted. Consequently, the average number of days a child spends in ORR custody has dramatically increased from 34 days in 2015 to 59 days as of last month. I left Tornillo feeling as though I had participated in a state inspection of a medical facility. While I am grateful to ORR and BCFS for mitigating the harm and further traumatization of these children, I would be remised if I did not acknowledge the feeling of helplessness that I felt as I saw the incredible number of children waiting to be released. They are far away from their home, family, and cultural norms and must live on a schedule that does not allow for any variance from routine. As a mother of two children, one of whom deals with anxiety, I cannot imagine what it must be like for the children to not be allowed any physical human contact during one the most fearful times in their lives. 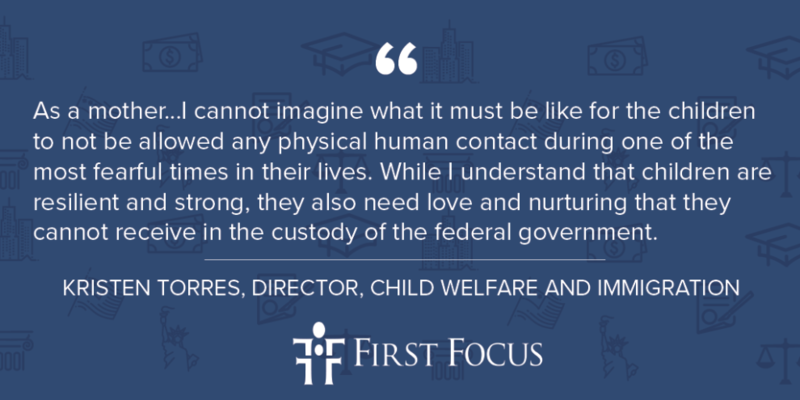 While I understand that children are resilient and strong, they also need love and nurturing that they cannot receive in the custody of the federal government. Institutionalized care is not in the best interest of these children. Policy makers must review changes to the process that have prolonged the stay for so many of these children and youth. They have experienced so much trauma in their short life spans, and it is important that they are quickly placed with loved ones who can offer the love and support that they so desperately need. The number of kids in federal custody across the nation is at a record high, and this reality is visible in the expansion in Tornillo. Official number as of tour date, September 24th, 2018.